1. Remove the rear side trim panel (see page 20-127). 2. Pull back the rear part of the carpet as needed. 3. Remove the bolts (A, B), then remove the middle cross-member gusset (C). 4. Install the gusset in the reverse order of removal. When installing the mounting bolts for the middle cross-member gusset (A), tighten the mounting hardware in the sequence shown. 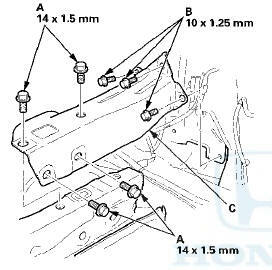 If the mounting bolts are not tightened in this sequence, damage to the quarter panel will occur.